This post needed to be re-uploaded here. In fact it HAD to be re-uploaded. 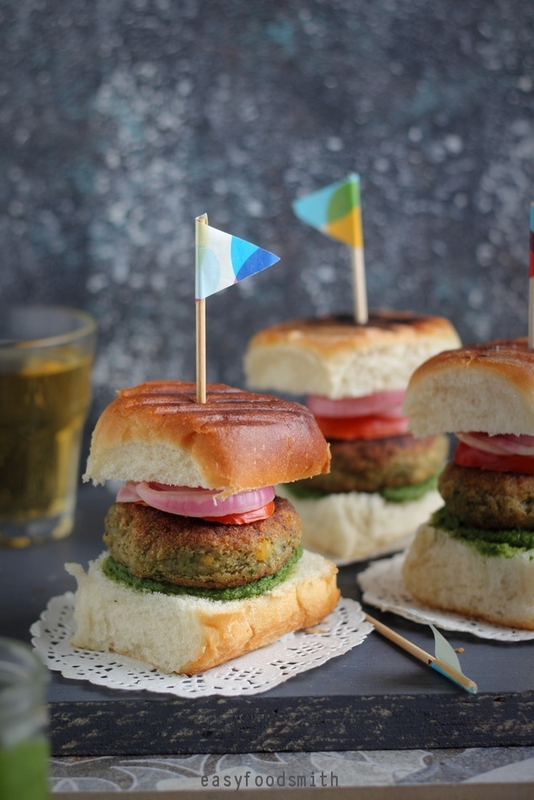 I have been making and serving these kebabs as starters and as main course but a few days back I served these as sliders and oh boy! They were so good. I am therefore sharing this post again with updated pictures. 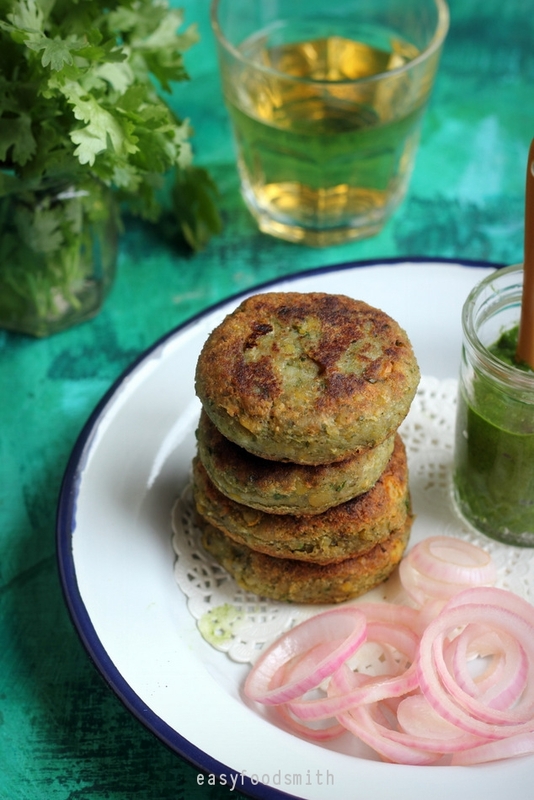 Consider these as the vegan version of the spicy and delicate Galouti Kebabs coz to me they are the nearly-perfect counterpart to the famous galouti kebabs of the Awadhi cuisine. Awadhi cuisine has a variety of kebab delicacies but galouti kebabs are unique since they have meat that is minced so fine and then tenderized that they virtually melt in your mouth. 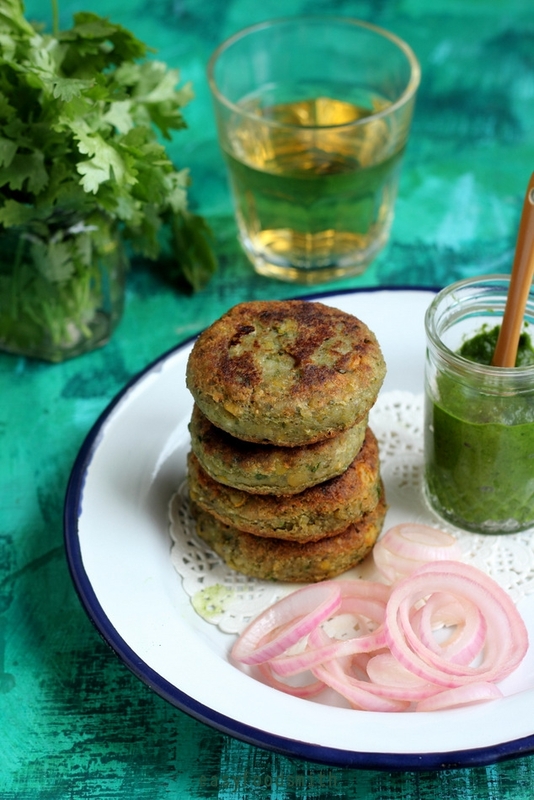 It is actually a super soft version of shami kebabs. Kebabs are delicately spiced meat patties that are shallow fried in ghee or clarified butter on a skillet or griddle (unlike the tandoori kebabs of Punjab which are grilled in an open clay oven). Legend has it that the ageing ruler of Lucknow, Nawab Asaf-Ud-Daulah, lost all his teeth but not his appetite for the kebabs! To satisfy the craving of the toothless nawab, the royal chef invented a new form of kebab. He used the finest lamb meat cuts, minced them very fine and added to them tenderizing agents along with a variety of spices to bring forth the now famous galouti kebabs. The only trick involved to make these kebabs is that the banana and gram dal should not be overcooked. They both should be cooked yet retain their shape and hold some resistance to pressure. If they get over cooked, you may end up with a sticky mixture to deal with! 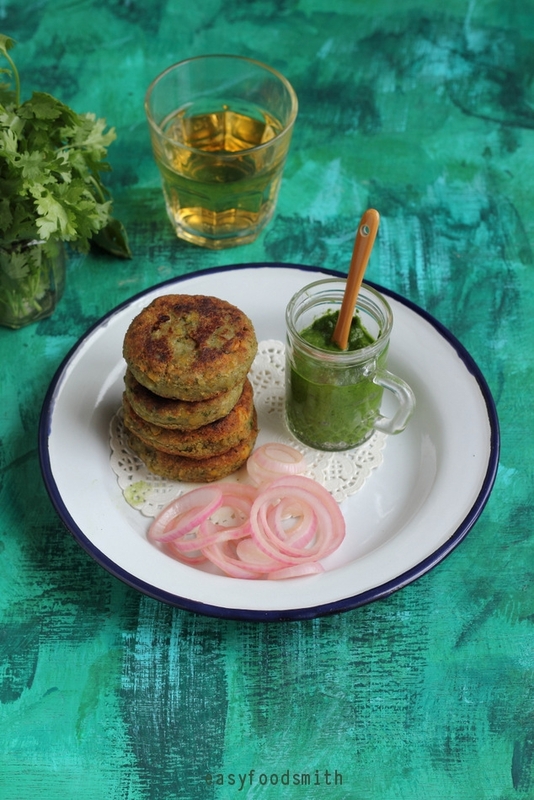 I love the kebabs with fresh cilantro or mint-coriander chutney but since these kebabs are bursting with spices which can be a tad strong for some, I therefore serve them with some Greek yogurt to provide a cooling effect for the palate. Start prepping by peeling and chopping the bananas in one inch thick pieces. Cook them till they are still a wee bit firm and should not be mushy. Drain the cooked bananas and set aside. Boil the gram dal in 3/4 cup of water till it is firm but cooked (I pressure cooked it till one whistle escaped the cooker). Drain the dal and keep aside. In a pan roast the whole garam masala – black cardamom seeds, cloves, cinnamon. 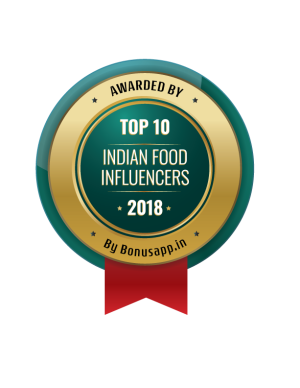 Ground the dal without using water and add cooked bananas along with the ginger, garlic, green chillies, powdered whole garam masala, mace powder, fresh coriander and salt. Grind till everything is well incorporated. Moisten your hands with a little water and scoop out the mixture and make 8 – 10 equal sized balls. Place the kebabs on a greased plate. Take 3 table spoon oil (less if using non-stick pan) and when it heats, carefully add 3 – 4 kebabs to the pan. Cook on a medium high heat. Keep checking for the colour of the kebab. Cook them till they become slightly brownish (about 35 seconds to 45 seconds) and then flip them over to cook the other side the same way. Keep adding more oil if required at any stage of frying. Remove the kebabs on a kitchen towel or absorbent sheet. Arrange the kebabs on the serving plate and serve them with yogurt and chutney of your choice. 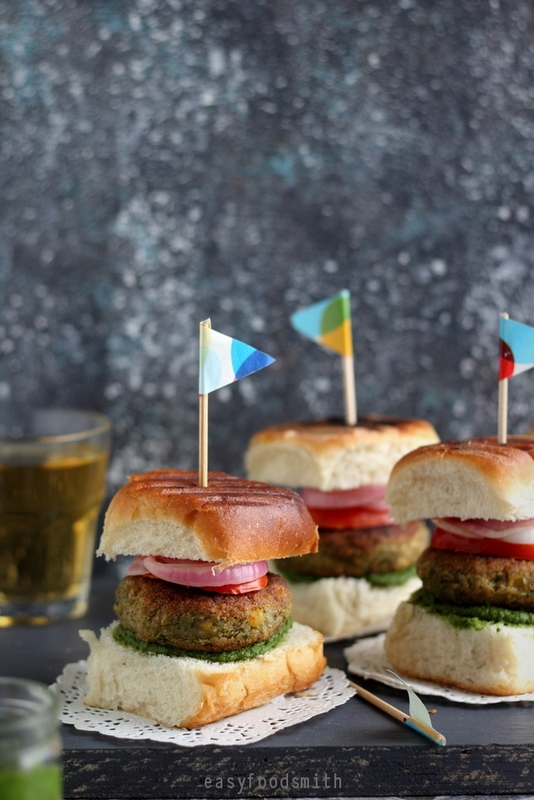 For Sliders, grill or toast the buns and slather green chutney on one bun. Place the kebab on the chutney followed by some sliced tomatoes and pickled onions. Place the other bun over it and serve. Enjoy! Note: Moisten your hands with water to work with the batter as it tends to be sticky due to the raw bananas. Note: Feel free to adjust the spices and heat to suit your taste. Note: If you do not have Green yogurt, use whisked hung yogurt or sour cream. Note: You can serve them as starters or snacks or you can serve them for main course with some flat bread such as Bakarkhani or Peshawari Naan. Have never tried the combo of banana and lentil…really love how they turned out…delicious! These would be such a fun unique meal at my house! I’d love to try them! YUM!!! I would love them as kebabs or as sliders! What a great vegan option! Wow, these look seriously delicious! Also, that background is everything, so pretty! A banana kebab!! this is so new to me but looks really delicious. Love the sliders idea. Wow love it what a great idea, could plantians be used instead as well? I guess they should work though I have never personally tried plantains. Nifty dish! And serving them as sliders? How much fun!